MILITARY HISTORY BOOKS - THE EDITOR'S CHOICE. NARRATIVE OF THE CAMPAIGN OF THE ARMY OF THE INDUS, IN SIND AND KAUBOOL IN 1883-9. TWO VOLUMES,Richard Hartley Kennedy,Richard Bentley, London, 1840. Kennedy was Chief of Medical Staff of the Bombay Division of the Army of the Indus. His memoirs describe the passage of the army through the Bolan Pass to Kandahar, the attack at Ghazni, the march to Kabul and the return to India. The journey, from November 1838 to December 1839, was uneventful for Kennedy except for the medical aid needed after the battle at Ghazni. Accordingly, much of his narrative is devoted to the Afghan landscape, daily events, and portraits of key figures involved in Afghan affairs. The book is based on extracts from his letters. This is the scarce 1840 original published by richard Bentley of London in two volumes. These were copies from the library of the Royal United Services Institution in London and have its bookplate at the front pastedown. The front endpapers and title page are embossed at the top edges with the RUSI seal. 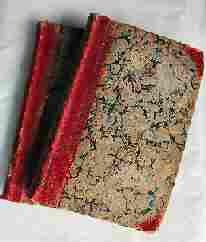 The volumes are presented in marbled boards with red calf spines with gilt titles. The remnants of small library number stickers are affixed to the bottom of the spines, overlapping the front and back calf. The corners are somewhat knocked and rubbed but internals are complete and tightly bound.